No other old English or Scottish ballad even comes close to the popularity of “Barbara Allen.” Brought over to America by the earliest pioneers, its roots can be traced to at least the year 1666 when Samuel Pepys wrote in his diary on January 2, “In perfect pleasure I was to hear her [Mrs. Knipp, an actress] sing, and especially her little Scotch song of Barbary Allen.” Even Abraham Lincoln sang “Barbara Allen” while growing up in rural Indiana. In America, “Barbara Allen” was sometimes called “Barbara Allen’s Cruelty or the Young Man s Tragedy.” It was also known as “Barbara Ellen,” and “Bonny Barbara Allan.” In the beginning of the 19th century “Barbara Allen” was used both as a children’s game and as an instrumental at dance parties. In the mid eighteenth century the tune of “Barbara Allen” was also used for several religious texts. During the Civil War, it provided the melody of a song called “Brother Green,” which told the last words of a dying soldier. By the end of the 19th century, ballads such as “Barbara Allen” were all but forgotten in the British Isles where they originated. Just when these ballads were on the edge of oblivion, in walked an English folksong collector named Cecil Sharp. As early as 1910, Sharp combed America’s southern states from Georgia and North Carolina to Virginia, Tennessee and Kentucky. There he found a wealth of English ballads that had long been forgotten in his native land. He collected enough versions of “Barbara Allen” to fill sixteen pages of his book English Folk Songs of the Southern Appalachians. When we think back to the roots of bluegrass music, it’s important to remember that ballads like “Barbara Allen” were the bedrock that bluegrass music was built on. For certain, the ancestors of the first generation of bluegrass singers like Bill Monroe, Lester Flatt, Carter Stanley, Don Reno and Mac Wiseman were so familiar with ballads like “Barbara Allen” that they could sing all the verses from memory. Even today, Barbara Allen has maintained its status as America’s best- known ballad. In recent years, it has been recorded more than three hundred times. A short list of but a few of the artists who have recorded “Barbara Allen” might surprise you: Eddie Arnold, Joan Baez, Mac Wiseman, Hylo Brown, Doris Day, Judy Collins, Bob Dylan, Dave Dudley, The Everly Brothers, Tennessee Ernie Ford, Art Garfunkel, Crystal Gayle, Tex Ridder and Dolly Parton. And for your sake he’s dying. And says: Young man, you’re dying. And says: Young man, I won’t have you. And saw his pale face coming. And she bursted out a-crying. If I had done my duty. And I’ll die for him tomorrow. She died on Easter Monday. A rose tree out of the other. 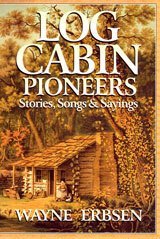 NOTE: Portions of this article are from Wayne Erbsen’s book, Log Cabin Pioneers, available from us at Native Ground Music.